Or you could just organize your comics the exact same way I do. But seriously, the next set of scripts I post might meet your needs. It's an idea I developed, before going back to the simpler method. This is my attempt at a smart sorting script that can handle nested directories and different title stored in the same directory. It's a two part process. makesort.pl scans the comic directory recursively and makes a list of the titles it finds and where it found them. It attempts to list the first two words, skipping the's. It eliminates non-letters, so X-Person and XPerson are treated and matched the same. It creates a file called "sortlist.txt" in the main comic folder. This file can be edited with notepad to eliminate any entries that you never want used. 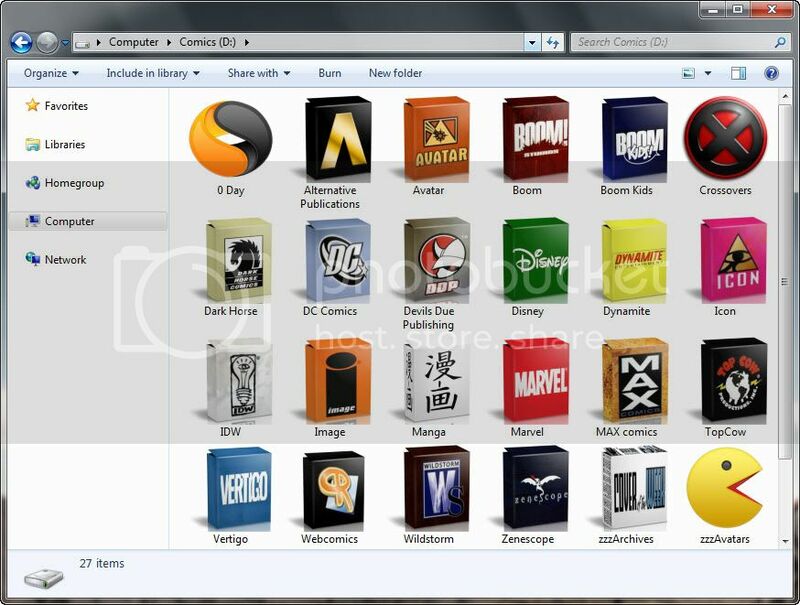 listsort.pl can then be used to sort the comics in the directory in which it is run. note:Both listsort.pl and makesort.pl assume that comics are sorted in a directory called "comics" at the top level. If this isn't the case the first line of both files needs to be edited. makesort.pl also has a setting to change the threshold number of matches before listing the directory in the "sortlist.txt" file. If you'd like to run listsort.pl without having it actually move the files, just add a # before rename in the .pl file. Edit: This version is obsolete. Both listsort.pl and makesort.pl assume that comics are sorted in a directory called "comics" at the top level. If this isn't the case the first line of both files needs to be edited. but this is not working..
Edit: I managed to make it work for each individual publisher folder. So, all the new unsorted files are initially in the 0 Day folder, and I then move files belonging to one publisher to a zzUncategorised folder within each individual publisher folder, and then run the scripts. Just use $comicdir ="/. "; and make sure you are running the scripts from the D: drive. Standard Perl doesn't understand drive letters and you need to use either "/" or "\\" for the seperator. I should put that in the note in the .pl files. This post has been edited to fix a mistake. Just use $comicdir ="/"; and make sure you are running the scripts from the D: drive. What i would like to do is to run the script from within the 0 Day folder (see my post above for a screenshot) and let it sort the files into their respective folders within the various publisher folders.. I was mistaken. "/" is the root directory, but when the rest of the script attempts to access a subdirectory, it becomes "//subdirectory" which is wrong. So to get around this you need to use "/. ", which works for the root directory and subdirectories. I tested this out and it works, but tries to read the system folder of "System Volume Information" and "$RECYCLE.BIN", so I had to update the scripts to prevent the script from quitting when it can't access protected directories. With any luck it should work for you now. The update is found in the scripts original location. Yes.. it is working now ! 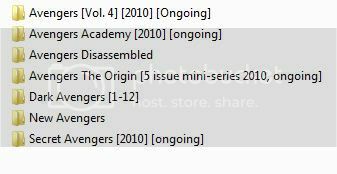 So, I fear that when i run the listsort.pl, it will put all the GIjoes in one folder and all the avengers in another. How do we handle this problem ? makesort.pl also has a setting to change the threshold number of matches before listing the directory in the "sortlist.txt" file. Maybe the threshold matching could help in some way ? However, some fine-tuning is required. Now you see why I went back to the simpler comicsort.pl which while not perfect, worked good enough for my needs. However, I've thought up a way to objectively test the code for accuracy. 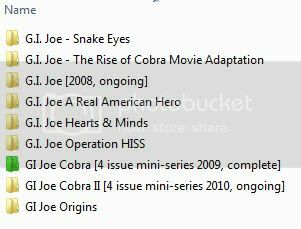 I can modify the scripts to work off a text file list of comics and see how accurately it can virtually sort every file back to its correct location. Now you see why I went back to the simpler comicsort.pl which while not perfect, worked good enough for my needs. Yes malor89, I fully agree for you.. I've begun slightly simplifying my folder names.. I've thought up a way to objectively test the code for accuracy. I can modify the scripts to work off a text file list of comics and see how accurately it can virtually sort every file back to its correct location. I am really looking forward if somehow you can post a code accurate enough for such a folder structure..
- changed the $minmatches default to 1, since testing revealed it provides a significant accuracy improvement. - changed the detection algorithm, it now tries to match the entire title, removing a word at a time until it finds a match.